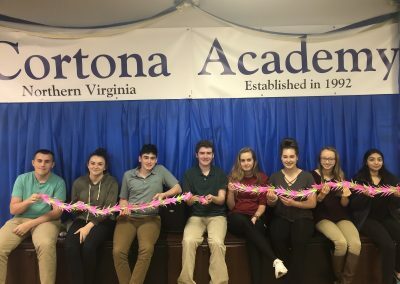 This spring the Cortona Academy community of students and professors participated in a local campaign, the Community Crane Infinitive, in order to honor those people in the United States who are living with stage IV breast cancer. 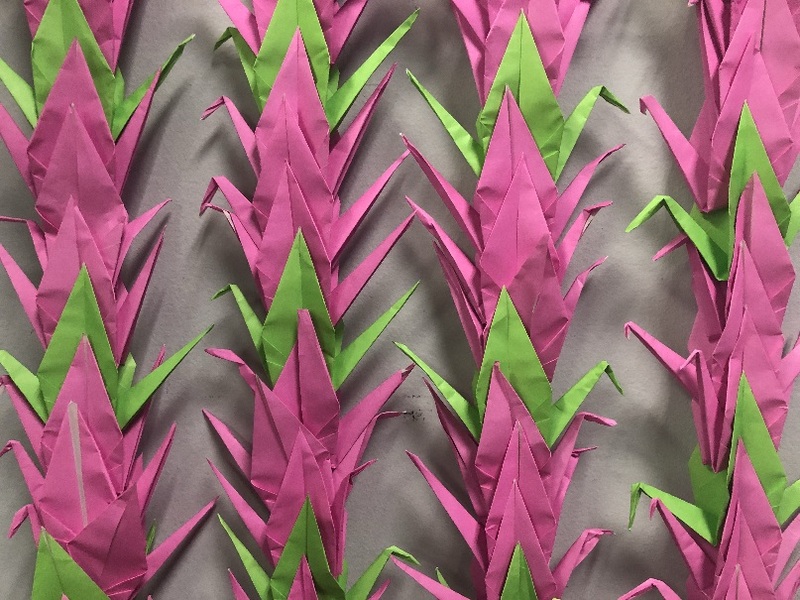 The initiative aim to make 150,000 origami paper cranes in representation of the 150,000 individuals living with this level of breast cancer in the United States. 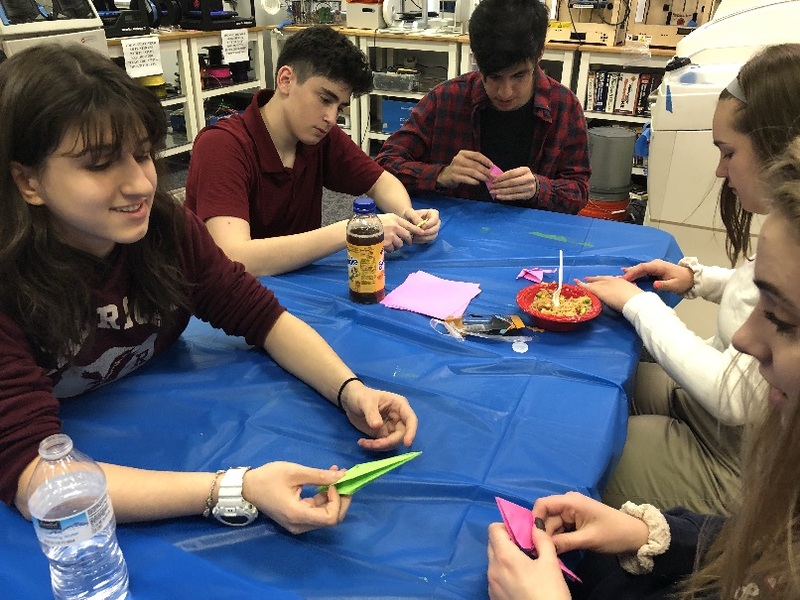 Our students contributed 200 origami cranes over the course of 2 weeks, working together to create these intricate cranes with the humanitarian spirit that they’ve learned to develop here at Cortona Academy. 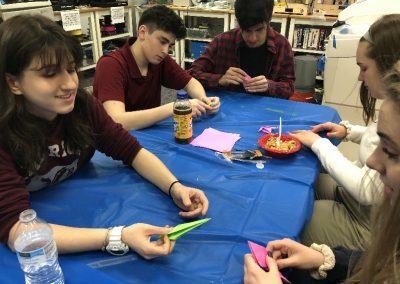 It’s important to understand the background and symbolic importance of these paper cranes that are the foundation of this initiative. The tradition of origami cranes, or rather, paper folding, stems from the Japanese culture. According to the Oxford dictionary, Origami is derived from the Japanese words oru, meaning to fold, and kami, meaning paper, (https://en.oxforddictionaries.com/definition/origami). 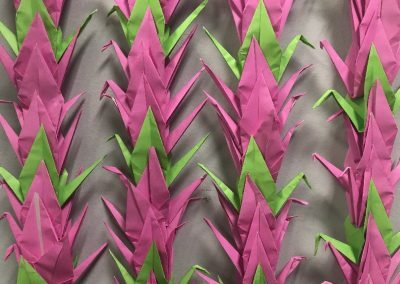 In 1603-1868 during the Edo period, paper folding became a recreational activity in Japan, viewed as a form of art, (http://www.pbs.org/independentlens/between-the-folds/history.html). This wonderful Japanese tradition is so well-suited to the initiative because it symbolizes hope and healing during moments of hardship. 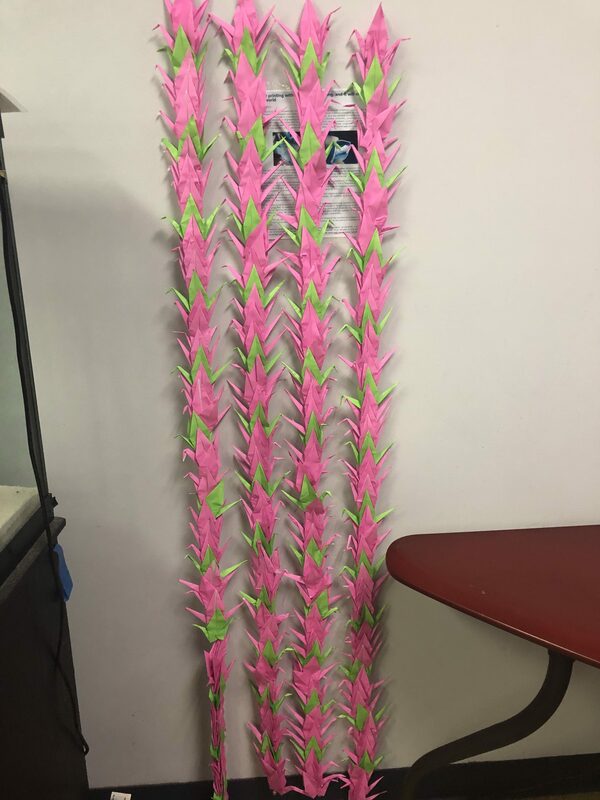 With this in mind, in order to fulfill Cortona Academy’s goal of making 200 cranes, the necessary supplies was provided by The Side-Out Foundation, an organization with the “mission to enhance breast cancer research and awareness,” (https://side-out.org/). As with any new endeavor, the challenge was to start, learn and practice. 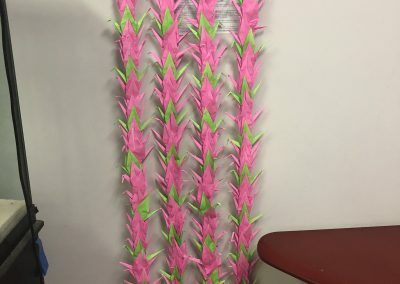 The acquired supplies included, “ 5 pieces of practice origami paper, 25 sheets of green paper, 75 sheets of pink paper, 2 silver beads, 2 black rubber hoops, and 2 six-foot strands of fishing line,” (http://info1.side-out.org/crane-project/). 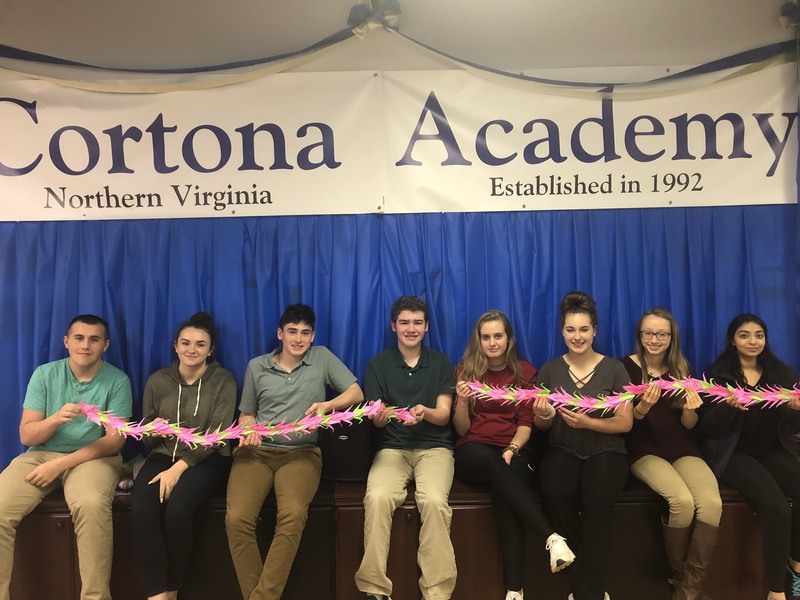 Cortona Academy students, after stepping up for the challenge and overcoming the hurdles of trial and error, were able to understand how to fold 200 sheets into cranes and string them together into a beautiful chain. 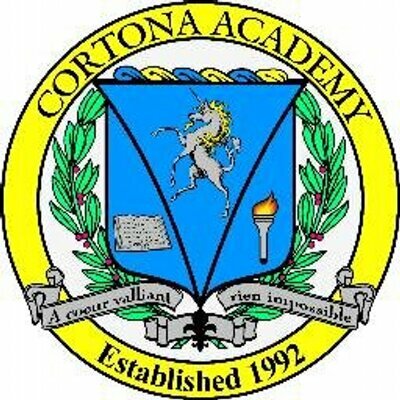 Although the project was much more difficult than meets the eye, Cortona Academy’s students and participating professors learned valuable lessons and experienced a success coming to fruition through hard work and dedication. One student expressed these sentiments, saying, “At first, I was frustrated learning how to make the paper cranes, but while working together with my professors and classmates I started to see the bigger picture and now I’m proud that we were able to participate in this important initiative,” while another described the experience as, “inspirational.” Overall, Cortona Academy is more than happy and willing to keep the humanitarian spirit alive in order to contribute in awareness advocacy for stage IV breast cancer.